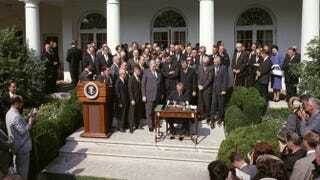 President Lyndon Johnson signs the Economic Opportunity Act on May 21, 1964. A half-century later, it’s time for America to declare a new war on poverty. Like the best presidential addresses, Johnson’s “War on Poverty” speech was enormously ambitious. He argued that a nation as rich and powerful as the United States had a political and moral obligation to lift millions out of poverty, help create jobs for inner-city youth, protect the elderly and provide food for the hungry. The war on poverty became the heart of Johnson’s “Great Society”—a vision of American democracy that sought to amplify and extend social policy enacted during the New Deal to an emerging generation of Americans. But two generations later, the same inequality Johnson so eloquently described—and vowed to defeat—is growing throughout America, and leaving a wealthy nation scarred with pockmarks of hunger, unemployment, mass incarceration and homelessness. The anniversary of his speech, though, is an opportunity to ponder missed opportunities, celebrate successful programs and, most importantly, to look ahead to the future. What can we do now, and how do we want future generations to remember us? Now is the time for black activists and their allies to demand a new war on poverty. In contrast to 1964, when a burgeoning civil rights movement inspired and cajoled the federal government into action, we live in a time when politicians are loath to speak truthfully about the state of contemporary American politics. Instead, both liberals and conservatives offer bromides about “American exceptionalism” that ignore rampant and politically fueled inequality that marks the post-American century. Johnson’s State of the Union, by contrast, proved truly remarkable. One is struck, when reading it again, by the president’s bold advocacy of multicultural democracy and social justice that would extend from whites in Appalachia to Native Americans on reservations out to blacks living in inner cities. Rather than abandon those holding onto the nation’s lower economic rungs, Johnson embraced them in a speech that advocated a progressive approach to immigration reform, infrastructure spending and the pursuit of world peace. Indeed, many of the issues and themes so eloquently and boldly addressed 50 years ago still bedevil contemporary American society and politics. But a new war on poverty could prove just the kind of ambitious political tonic capable of addressing enduring problems. In the aftermath of the Great Recession, the biggest loss of wealth and jobs since the Great Depression, America has witnessed a staggeringly uneven recovery that has overwhelmingly favored the rich. Congress is so dysfunctional that even with an unemployment rate surpassing 7 percent, benefits for the jobless seeking work have been cut, a situation that is still unresolved. So what is to be done? For starters, those of us—of all stripes—interested in racial, economic and gender justice can unequivocally declare 2014 the year of the new war on poverty. Through social media (how about a hashtag? #NewWarOnPoverty), blogs, editorial pages, protests, demonstrations and lobbying, this year could go down in history as a time when an entire generation looked toward its not so recent past for a way forward into the future. A contemporary poverty war unapologetically presumes the importance of not only an activist government but of active citizenship. During the 1960s it was the latter, most often but not exclusively led by black folks who pushed, cajoled, demanded and inspired the federal government, not to mention millions of ordinary Americans, to reimagine democratic ideas and ideals. That activism was channeled by leaders like Martin Luther King Jr. and eventually voiced by President Johnson. Activists rallied to Johnson’s war on poverty, and held his feet to the fire over the war in Vietnam. The beauty of the war on poverty was the way in which it served as a wellspring for evermore ambitious and humane visions of American and global society. Fifty years later that vision remains more compelling than ever. Our task—our moral and civic obligation—is to renew the dream of ending inequality for future generations by starting with our own.